I was thinking about how I haven’t had bacon in a really long time and how much I miss it. My ideal way to eat bacon would be in a BLT, but I decided to pair it up with some green beans instead so that I can get some veggie intake to absorb some of the bacon grease ( mind trickery). 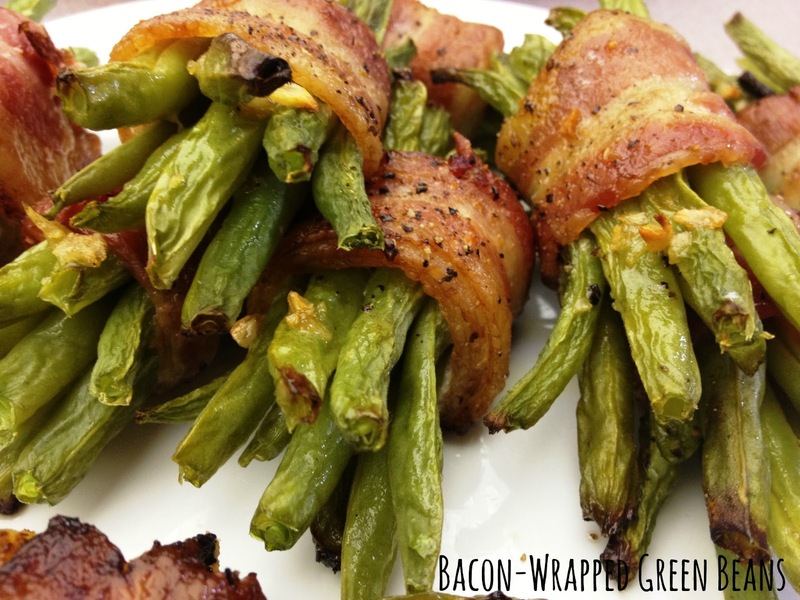 I went for the bacon green bean recipe from Williams-Sonoma and already had all of the ingredients on hand. The bacon made the apartment smell so good and I kept opening the oven to eagerly check if these bundles were ready to eat. This recipe actually cooks the bacon for a little bit in a frying pan first and then transfers to the oven. Or like lazy me, you can use raw bacon to wrap around the bundles instead and just cook it for an extra 10 minutes in the oven. The bundles turned out delicious and the brown sugar is really what makes the flavours pop. Such a perfect side dish or an appetizer! Maybe I’ll make them again for the Super Bowl this weekend! What is your favourite way to eat bacon? Or for the vegetarians, what are your favourite meat substitutes? Roast until the bacon is cooked through and browned, 20 to 25 minutes (extra 10 minutes or so for raw bacon). Let stand for 3 to 5 before serving. Hi everyone! I've received some amazing samples throughout the past few weeks that I wanted to share with you all. I am always on the prowl for new healthy snacks to keep at my desk/in purse and these ones are my go to snacks at the moment. The Health Warrior Chia Bars come in 3 different flavours, peanut butter chocolate, coconut and acai berry and each bar contains about 100 calories. When I first looked at the package I thought, cute packaging but these bars are small. I opened up the PB and Chocolate bar and at first glance it reminded me of a Larabar/Sesame Snap. It smelled good and had a soft texture which was surprising because in my mind I thought these bars would be hard. After taking my first bite I was super impressed by the texture! I am picky with my bars mainly because of texture but these were chewy in a good way, it didn't take me 3 minutes to chew and a gulp of water to get it down. The chia seeds are definitely present in this bar, every bite is filled of healthy chia goodness and you get a nice crunch in every bite. The crunch of the chia seeds is nothing like the crunch of a nut, but more similar to a smaller sesame seed. The flavour was more chocolatey than PB and I actually don’t think I could taste the PB at all really, which isn't a bad thing since I like chocolate anyway. What made me really happy about these bars is although small at first glance, these things were filling! I was so full after eating one and that full feeling lasted at least 3 hours, AMAZING. That’s why chia seeds are considered a super-food, they are fully packed with protein, fibre, and omega leaving you satisfied and full of energy after eating them. The acai berry was the next flavour I tried and it was incredibly delicious! The fruit flavour was very noticeable in this bar, and I really liked it a lot more than the chocolate. The coconut was the winner though because I have a coconut obsession and the flavor was authentic and not too sweet. I'm a bit obsessed with these bars now. And while you're purchasing these perfect energy snack bars join up on their website to possibly become a Health Warrior! Please throw away all your stashes of fruit roll ups or fruit by the foot or whatever other corn syrup ridden snacks you are feeding your kids and pay attention to these clever snacks by Naked Edge. I was so impressed with these handy snacks and the variety of flavours totally had me intrigued Veggie Gos’ are organic fruit and veggie mixed straps that have no added sugar to them and are gluten-free! They are a perfect way to get in some veggies and fruits while on the go and only 17 to 18 calories per snack. Kids will love these things too and they wont even know there's veggies in it! To find out more about The Naked Edge Snack story of dedicated passion in creating nutritious and non-processed foods read here . These fruit/veggie straps are soft and chewy and packed with flavour! For each flavour the ingredients on the front of the packaging are literally the only ingredients in these bars. This one was very berrylicious and sweet! It was easy to eat and I almost wished the strap was bigger! It is very comparable to a regular fruit snack out there meaning that your kids will totally eat it and have no idea its packed full of spinach with no added sugars! The first bite I could taste the beets but the cinnamon and sweet potato really give this snack such a nice flavour. I like it a lot because it wasn't overly sweet and it actually made the beet flavour bearable which is hard for me sometimes when it comes to eating beets. OMG this was so good. It literally was melt in your mouth sweet potato goodness. I love that there's cloves, nutmeg and ginger in it because it makes the sweet potatoe flavour so robust. Its literally a sweet potato pie for your pocket. This one is by far my favourite. I am not a huge fan of ginger but it tasted really nice paired up with the carrots and apple. Its probably my least fave of the bunch but still very edible. I am seeing all sorts of claims for healthy chips these days and its hard to know which ones actually live up to their claim. I am a huge chip fan and I could eat a bag of Doritos in one sitting but I try very very hard to stay away from those kinds of chips because its just a bag of high calorie crap. When I received samples from Flamous Brands I was really shocked at how healthy these chips actually are. I spent a few minutes reading the bag and then thinking to myself can falafel chips actually taste good and also be this healthy? These chips are gluten-free, USDA Certified Organic; Non-GMO; Vegan; Kosher; no Trans Fat, Cholesterol, Coloring, Dairy, Nut, Wheat, or MSG. Pretty impressive right? The chips are a delicious blend of 15 vegetables and herbs starting with corn and chickpeas, and then layered with other vegetables. I am a fan of falafel's but a falafel chip sounded a little questionable at first but of course I opened them up immediately. I had my boss with me and we both dug in. I looked at her for the first response and she says “OMG Nat these are good! !” minutes later we were scarfing down the whole bag. I definitely was taken back by these chips as I did not expect them to taste THIS good. They were so crunchy and full of flavour, but not sickening at all. They tasted very authentic and I literally had the whole office loving them. One of the girls actually went out a few days later and found them at Whole Foods and bought a bag. They also come in spicy falafel which was my fave because of the added heat and they come in zatar flavour which is an oregano-based mixture of herbs. I made some hummus to go with these chips and its now a weekly staple in the house. Good bye tostitos and salsa, hello falafel chips and hummus! You can enter your postal or zip code here to find out what locations carry these chips. Who loves granola? I know I do! Especially when it’s homemade! I usually don't make my own granola and instead buy the bland/dry grocery store brand's. I mainly use it to sprinkle over my yogurt or just eat it right out of the box as a snack. After trying this recipe out and tasting the fresh flavour's of dried fruits and cinnamon, this granola kick's any store brand off the shelves! 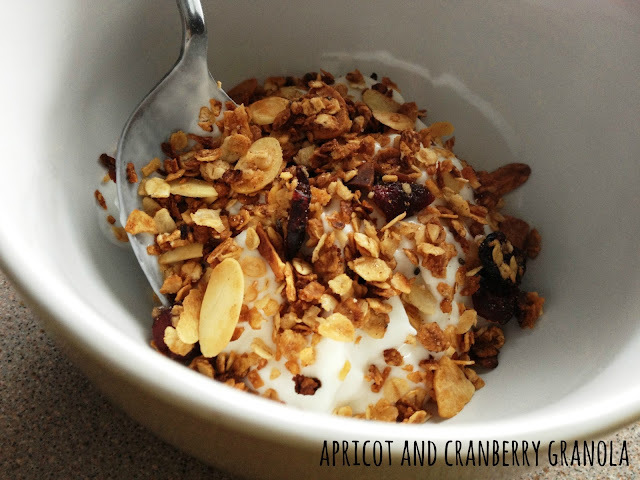 I can literally eat this granola right out of the bag as a snack, but adding it to plain or vanilla Greek yogurt almost makes it into a dessert rather than my breakfast! Its so crunchy and tasty and will last for over a week stored in an airtight container. Yay for fresh granola goodness! I will be sending you an email shortly to get address info to pass on over to Manitoba Harvest! Combine all of the dry ingredients in a large bowl and mix well with a wooden spoon or whisk. In a small saucepan over medium heat, combine butter and honey until melted and combined. Do not bring to a boil. Pour the butter/honey mixture over the oats and mix until coated well. Spread oats over parchment paper on a baking sheet and bake in the oven for 15 to 20 minutes or until lightly golden. Wait until the oats are completely cooled before storing in an airtight container. Can we talk about canned tuna for a sec? 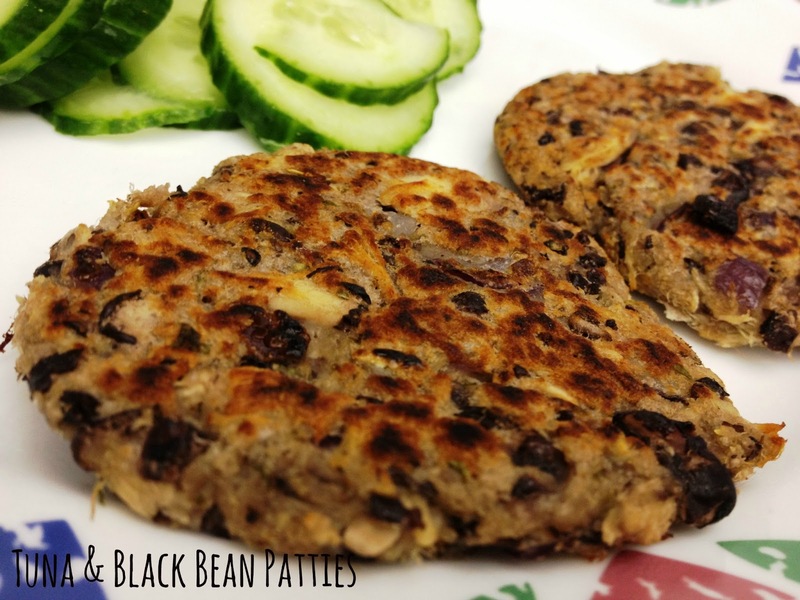 I have an issue with eating canned tuna but can totally pop them into these patties no problem. But if I were to open a can of tuna and plop it on my salad, it would gross me out. Does this make me weird? Maybe so, but we all have our oddities! That being said, canned tuna comes in handy for these patties and well that’s about the only time I use canned tuna. My sis and I made these on the weekend and used black beans this time instead of the usual chickpeas. I must say that I like the black bean version much better. What I really like about these patties is that you don’t have to use egg to bind the mixture together! 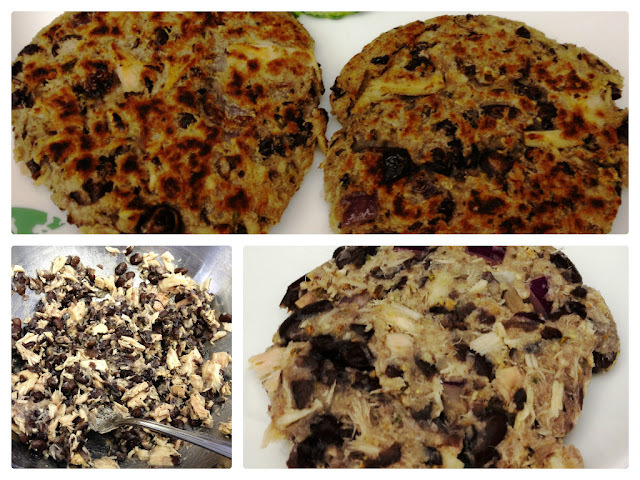 The water from the canned tuna, plus the small amount of bread crumbs and flour really help to shape these patties well. You can fry them up in some olive oil and then top them with tzatziki or sour cream, or any sauce really. They are quite delicious and healthy and QUICK, kind of the perfect meal! Combine the canned tuna with water and black beans in a large bowl and start breaking apart the mixture using a fork. Mash until mixture is loosely broken up. Add in spices and hot sauce and mix well. Add bread crumbs and flour and mix until evenly coated. If mixture is too wet add more breadcrumbs. Shape patties to your preferred size using your hands. Heat a large frying pan with canola oil or olive oil to medium-high heat. Once oil is hot, add in patties and cook for about 3 minutes per side or until browned. Serve with a side of salad and a garlic or sour cream dipping sauce! Healthy meal in less than 15 minutes! Hello Monday!!! A tiring work week ahead but everything will be okay because I have a big batch of Peanut Butter Chocolate Chia Seed Cookies to keep me company! 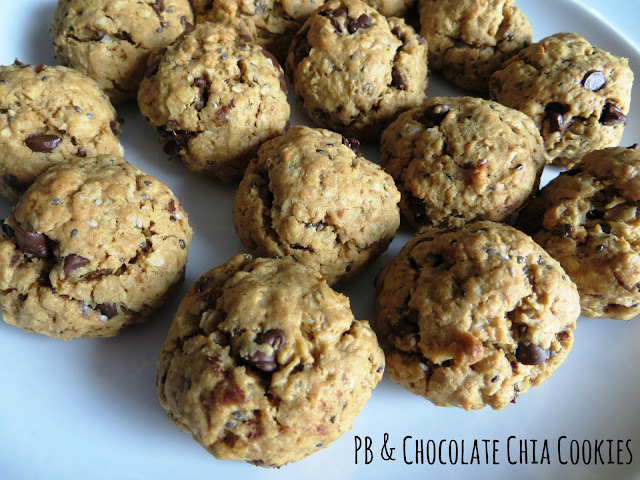 I made these healthy cookies over the weekend and now I can’t stop snacking on them. These cookies oddly enough taste better the second day. The first day I found them to be a bit dry but after sitting in a tupperware overnight these cookies have gotten a bit moist and now they just taste incredible! They are perfect to snack on at anytime of the day and go really well with a big glass of milk. They are packed with protein, fibre and omega and are sweetened with coconut sugar instead of refined white sugar. What’s great about coconut sugar is that it’s naturally low on the glycemic index so these cookies won’t stress out your blood-sugar levels. I am also happy to say that this was my first recipe using gluten-free flour, yay. I was scared that it was going to fail miserably because the cookies weren't spreading out while in the oven, but I guess I just realized that whatever shape you form them into they will stay like that and cook! That’s why these cookies look like balls instead of a flat cookie, but who cares right? Once they taste amazing and have healthy goodness inside that’s all that matters! I found the original recipe over at yummymummykitchen and modified it only slightly. I can’t stress how great these cookies are, especially if you’re a peanut butter lover like me! Happy Baking! In a medium bowl, whisk together the oats, flour, baking powder and chia seeds. Set aside. In the bowl of an electric mixer, beat the sugar and eggs until creamy. 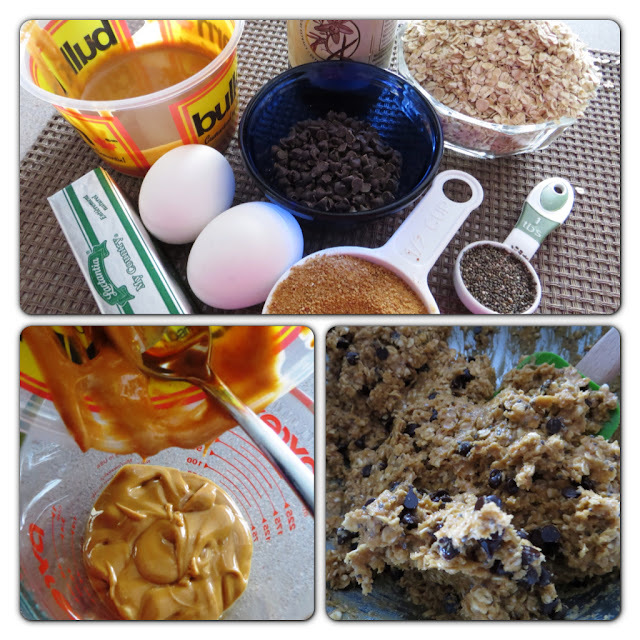 Add in the peanut butter, eggs and vanilla and mix until combined. Gradually stir in the oat mixture to combine well and then add in the chocolate chips and stir. Place a heaping tablespoon of dough onto the cookie sheet and shape the dough into balls using your hands. Bake cookies for about 12 minutes and let cook on a wire rack. Enjoy! I was excited to receive a product sample of Manitoba Harvest's Hemp Hearts as I've heard the hype but never really paid any attention to what hemp hearts are all about. After some sampling and researching I've finally decided that hemp hearts are ridiculously healthy for you, mild flavoured and they can be sprinkled on pretty much anything to add extra protein and essential fatty acids to your meal or snack. Hemp hearts are the shelled seeds of the hemp plant. These seeds have a mild nutty flavour and per 30g serving, Manitoba Hemp Hearts contain 10g of easy to digest protein, 10g of omegas – and many more minerals. Why Manitoba Harvest Hemp Hearts? Manitoba Harvest partners direct with hemp farmers to source the raw, non-genetically modified hemp seed. The pre-screened farmers deliver direct to Manitoba Harvest’s facility, creating a closed-loop sourcing system. Products are made fresh in-house at Manitoba Harvest’s state-of-the-art kosher and organic certified* facility. Manitoba Harvest also goes through voluntary audits and certifications to ensure we lead the market in quality assurance. How to use Hemp Hearts? Hemp Hearts can be sprinkled on cereal, yogurt, salad, mixed in with granola, smoothies, or just eat them right out of the bag. You can also incorporate hemp hearts in a number of recipes found here. What are the Health Benefits associated with Hemp Hearts? Hemp contains all 10 essential amino acids and is vegan friendly! It’s also easy to digest as hemp easily assimilates into your body. Hemp is a rich and balanced source of Omega-3 and Omega-6 including the rare form of GLA (Gamma Linolenic Acid). GLA has been shown to help maintain heart health, healthy cholesterol and blood pressure levels and aid in hormonal balance. The essential fatty acids (EFAs) in hemp are both short and long chain making for a broader spectrum and working together to ensure your body has an effective metabolism. Basically I was sold after reading how incredibly nutritious these little seeds are. I was also relieved that there was no unpleasant taste to them as it always seems too good to be true when you find a super healthy food product that doesn't taste like crap (like greens+, blech!). I have become addicted to hemp hearts and my salad's, smoothies, and yogurt feel naked if I forget to sprinkle a few tablespoons over them. The nice folks over at Manitoba Harvest are offering one bag of their hemp heart’s to one lucky winner that resides in North America. Just enter below through rafflecopter for your chance to win. This is a really great product folks; you will be hooked once you try it! The lack of sleep is making me feel extra sluggish and all I want to do is sit on the couch with a bag of chips watching Parks and Recreation. Instead of that full bag of chips I only ate half (oops) and then decided to make these healthy apricot truffle balls (found at littlefigblog.com). I think the best thing for binge snacking is to have an array of already made healthy snacks available to you. If your fridge is stacked with yogurt, chopped fruits and veggies, hummus, etc then at least you’re more inclined to grab one of those. Also the key to healthy snacking is to change it up. If you only snack on an apple every day after work then of course you’re going to get sick of it and want something amazing like a toblerone cheesecake (or maybe its just me?)! You gotta get creative with your snacking and make fun things like apple and peanut butter sandwiches, greek yogurt with chia seeds and cocoa powder topped with berries, no-bake energy bites or these apricot truffle balls that I really enjoyed! 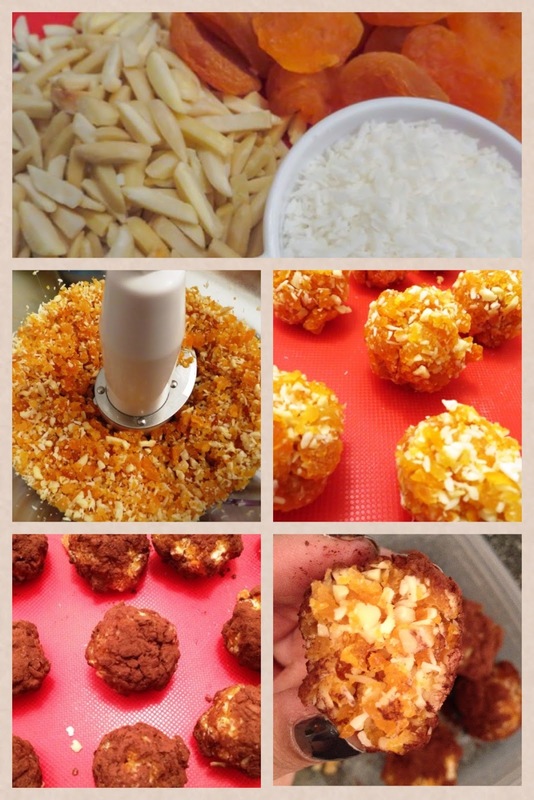 The apricot coconut truffles are really tasty and the almonds give them a nice crunch. They are very easy to make and make the perfect snack for a much needed energy boost. I had all of the ingredients on hand and it took me about 10 to 15 minutes to pulse in the processor and get these guys all rolled up and dusted in cocoa powder. You can also play around with ingredients and use variations such as vanilla extract instead of almond, shredded coconut for dusting instead of cocoa powder, add in a tbsp of protein powder, etc. Experiment all you want and let me know if you discover some great variations! These truffles are gluten-free, vegan and practically raw, how could you not love them? Combine all ingredients, except cocoa powder, in your food processor. Pulse until chopped. Using your hands, form the mixture into bite-sized balls. Roll apricot balls in cocoa powder to coat. Refrigerate truffles for 10 to 15 minutes before serving. These truffles will keep for at least 5 days in the fridge stored in an air-tight container. Happy Tuesday Everyone! 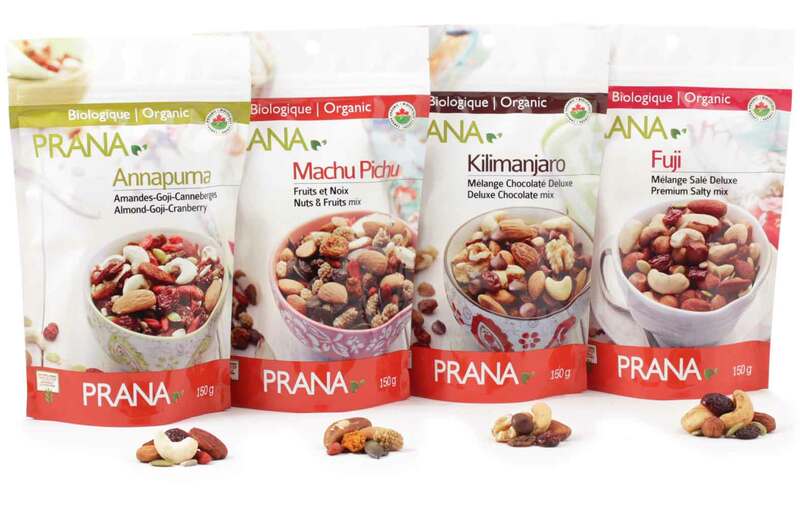 I wanted to share with you some fantastic products I received from PRANA a few weeks ago. Prana is a Canadian company based out of Montreal, Quebec that offers a wide variety of high-quality, organic products such as dried fruits, nuts, seeds, trail mixes, snacks, cacao, coconut products and super foods. They have an extensive list of healthy products that I am interested in and I was happy to see that their products are available for purchase at a lot of health food stores across the GTA. I am especially interested in the organic raw lucuma powder! Since I have never tried any of their products before, I was very excited to receive some samples of their new exotic trail mixes: The Kilimanjaro mix, Machu Pichu mix, Fuji mix and Annapurna mix. The first mix I tried was The KILIMANJARO mix which is a blend of 70% dark chocolate, almonds, walnuts, salty cashews, sultana raisins, and naturally sweetened cranberries. This mix by far was my favourite due to the little dark chocolate chips (surprise, surprise I'm such a sucker for anything chocolate). The combination of sweet and salty in this mix was perfect and I loved that there was an equal amount of each ingredient in the bag. I really can’t stand when I buy a bag of trail mix and there are only two or three of one nut and 1000 of another. I actually finished this bag within a couple of days because I kept adding it on top of my oatmeal in the morning. The melted chocolate in the warm oatmeal was sooo good and the nuts made this the perfect protein-packed breakfast. The next mix that I tried was The MACHU PICHU mix which is a unique blend of nuts and exotic fruit, including Incan Golden berries, white mulberries, Brazil nuts, Goji berries, European pumpkin seeds, and almonds. This mix was a bit sweeter than the Kilimanjaro because of all the different dried fruits but the pumpkin seeds and Brazil nuts really balanced the mixture out quite nicely. I am proud to say that this trail mix introduced me to the wonderful world of dried mulberries. I cant believe how tasty they are and these super addictive lil berries are very healthy as they contain high levels of iron, calcium, vitamin c, fibre and resveratrol. Next was the FUJI mix which combines crunchy roasted nuts, seeds and dried fruit that are topped with a touch of virgin coconut oil and sea salt. This mix is so much better than your average deluxe mixed nuts that you buy at the grocery store. The sea salt is not overpowering and the hint of coconut oil flavour gives these nuts a deliciously distinctive taste! 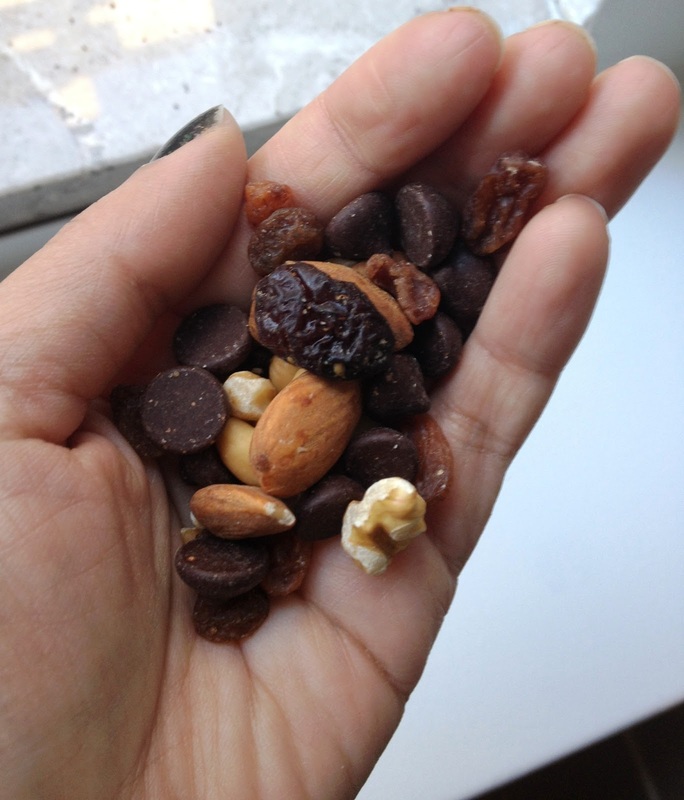 The ANNAPURNA mixture has almonds, cashews, raisins, sunflower seeds, cranberries, and Goji berries. I really like the chewy goji berries and the addition of seeds in this mix. I've put this mix on my salad for extra protein and antioxidants, and this mix is ALWAYS in a little zip-lock bag in my purse for a quick energy-boosting snack. Overall I was extremely happy with these trail mixes and am very interested in the other products that Prana carries. The company being Canadian is one reason I want to purchase their products in the future but the more important reason is because they are making reasonably priced organic/vegan products with the environment and their customer's health in mind. The snack mixes are original, tasty and gluten-free and are packed with quality ingredients. I usually find trail mixes bland and full of hard raisins or stale-tasting nuts but these were really fresh and you can actually tell that their ingredients are of high standards. These mixes are perfect to stash at your desk, in your purse or to just throw out in a bowl on a coffee table when guests come over. These new trail mixes are at a retail price of $ 4.99 for 150 g. and are available across Canada in health food stores, IGA, Metro, in some pharmacies and online in bulk (1 kg) at www.boutiqueprana.com .